In an exclusive Nation interview, the ousted Honduran president calls the new State Department aid cutoff a "direct blow" against the regime that exiled him. Honduras’ ousted President Manuel Zelaya. The US announcement of an aid cutoff to Honduras is a “direct blow” against the strategy of the coup regime in Honduras, deposed President Manuel Zelaya declared in an interview with The Nation today. 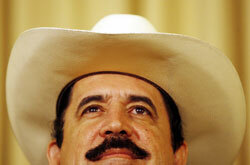 Zelaya announced that he is “prepared to return” to Honduras “independently of any US plans” and to “protect the population.” The US declaration was a “great step forward” that puts intense pressure on the Micheletti regime in Honduras to commit to the peace proposals of former president Oscar Arias of Costa Rica. The aid termination will include $215 million in five-year Millennium Challenge grants, Zelaya said, in addition to $16 million in military aid already cut. Secretary Clinton chairs the Millennium Challenge Corporation, which meets this coming week. The Nation will post Tom Hayden’s full interview with President Zelaya on September 4.